I have a WD Elements 1Tb external storage drive. Had it a few years but most of that it sat in a drawer. On it I know are copies of films & music & some rather excellent pics of a volcano in Iceland. I have been trying to get access to it on 3 different laptops.....all running Windows 10. Drive plugs in, sounds from it of of disk spinning then it's, 'spin, click, click.....spin, click click' for about 30secs then stops. Drive does not show up in File Explorer, or when I select 'This PC' in File Explorer. If I go to Control Panel\Hardware and Sound\Devices and Printers it shows up there. I select it & once again it's 'spin, click, click.....spin, click click' continuously until I select to exit Control Panel. It even shows up on 'Safely Remove Hardware, etc' & allows me to remove the device....but it is still spinning & clicking until I physically unplug it. It appears to be a sealed unit so no obvious way to pull it apart to see what's going on inside. I am willing to do that. In my limited opinion it sounds like a mechanical issue but I am willing to do a bit of work to see if it can be fixed/saved. This should bring up Disk Management window. Note which drives it sees. Plug in the drive. Does it see the drive? Does it show any partitions? 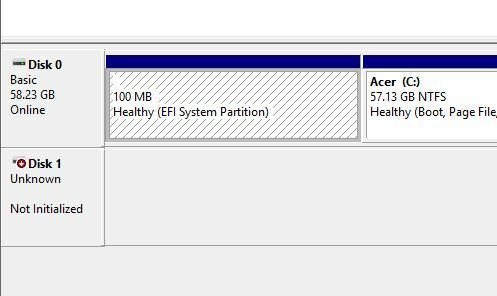 If you see partitions, right click on each and Change Drive Letter and paths and assign an unused drive letter to each partition. If you don't see it then then View, Show Hidden Devices. Now look in the right pane for yellow flagged devices. Right click on one and select properties then click on the Details tab. 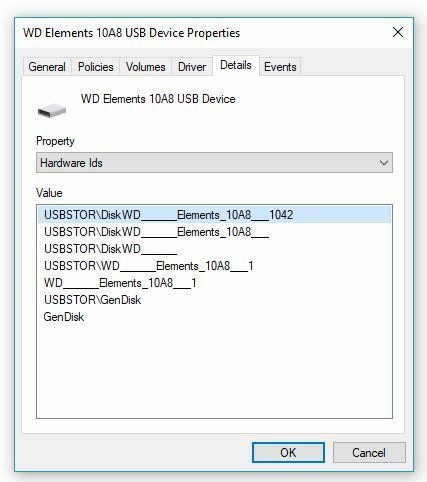 Change Property to Hardware IDs. Click on the top one then right click and copy. Paste that into a reply. Repeat for all yellow flagged devices. 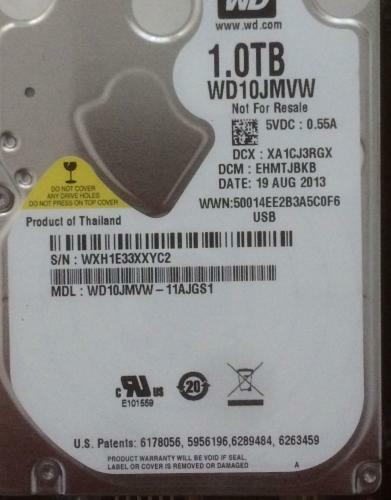 Is this a 2.5" or 3.5" drive? I believe it is a 2.5". In trying to be sure of that (have no paperwork at home on it any longer) it seems that a few others have been facing the same issue. This little vid is exactly my unit & what I am seeing! RKinner......apologies as I did not see your replay at first!!! Also then selected Device manager, Disk Drives & device is shown - no yellow flag. Does the drive spin when plugged in? usually if you pick it up and turn it a bit you will feel a gyroscope effect if it's running. There should be a part number on it somewhere. See if you can find it. Definite hum, vibrations as if internal mechanics are running.....no discernible gyroscopic effect I can feel. Screen grabs below of all numbers I can find.....most likely the "P/N" number as a wild guess!!! in a wdbuzg0010bbk-03 WD Elements Portable assembly. Expect if you pry off the feet you will find access to screws so you can start the disassembly. There are no screws under the feet pads so I got the top plate off. I also noticed a rattle whenever I tilt the unit so hopefully it's a simple fix.....once I get it open! I'll check on the videos & whatever other info I can find, get some tools & get busy! Got the drive out of the case but can not get to the internal disks & head themselves. Removed all screws that I could find but either I am not supposed to or there is a clip or something that I cannot see. I steadil prised the top cover open enough to be able to watch the operation inside. The disk spins up, then the read head/arm comes over.......then flicks straight back....it tries this every so often which is the source of the clicks. I then ran the WD Data Diagnostic but it cannot see the drive to be able to run anything.......so I'm stuck now I think. True.......but I think I'll play with it some more to see if I can understand how the read arm system works & maybe why it keeps switching back. I no longer have the data at this point so I have nothing to lose.....& am curious!! Thanks for your help RK.....much appreciated! ... see if I can understand ... why it keeps switching back. When most hard drives spin up they attempt to access track 0 (zero). After several failed attempts, they eventually give up. Thanks for that S-Dr......that's something I did not know. So after a bit of a think & a quick Google for any related info I am getting the impression that the info stored on track0 is required for the reading head to access the remainder of the disk. Is it possible that the track0 info just somehow becomes corrupted even if the disk is otherwise sound? When the mirror-finished platters are spinning, the heads are flying on a cushion of air less than 1/20 the thickness of a human hair above the platters. If the heads touch the platters, they scrape the magnetically recorded data right off of the platters in that location. Now you also have that loose, scraped debris flying around. and when it gets caught between the heads and platters, it causes even more damage. This is also why they suggest not opening a hard drive unless you're in a Class 100 clean room. The dust in the air is thicker than the distance between the heads and platters. But hey, it is your hard drive to do with as you wish.